While much of this website is available for free to everyone, there is premium content and downloadable resources that are available only to members. Additionally, you can choose to "follow along" with one of my courses, post exercises and assignments and get feed-back on your work. Please visit the membership page for more information and to join our community. 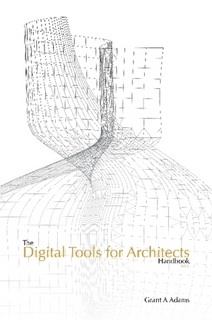 The Digital Tools for Architects Handbook outlines ways to harness the power of computers and digital creation in the world of architecture. This handbook is a quick reference to the digital tools that will help you showcase your ideas – your designs. While it is quite impossible to cover every software program, every piece of hardware, and everything digital in between, this handbook attempts to expose the highlights of digital design through a series of easy to follow tutorials. It is a working book as well as a reference book. To get the most from this handbook, you must engage each of the tutorials and understand the techniques they highlight. For additional practice or to view demonstration videos, follow along with the Digital Tools for Architects course available at www.digitaltoolsforarchitects.com. This book is required for both Archi 135 & Archi 136. The world of design – be it architectural or graphic – is hampered by the ability of designers to express the purity of their ideas in a format others can visualize. All too often, these ideas become fragmented, fractured, or otherwise mangled in the translation from the brain to the printed page. In the past, designers relied on the fluidity of their pens – their ability to draw, paint or model in the physical world – to express their ideas. With the addition of computer technology, we, as designers, have yet another tool to help us express our ideas. I must, however, be perfectly clear that all the computers and technology in the world can not overshadow fundamental design skills that must be learned in an analog nature. Computers and advancing digital technology are merely a supplement to an arsenal that we all, as designers, must develop. While this class is for architects, I use the term designers instead as I find it to be a better indicator of the importance of everything we create. Each drawing you produce, each computer model you build, even each paper you hand in for your english class must have design within it. By electing to study this field, you are electing to become a designer: a title which does not come lightly. You must think about everything you produce as it is a reflection of yourself, your energy, your emotion, your ideas. With the word designer in mind, I offer this course as an introduction to the digital tools that will help you showcase your ideas – your designs. While it is quite impossible to cover every software program, every piece of hardware, and everything digital in between, this class attempts to expose the highlights of digital design. It is a working class, one that requires participation, one that demands a hands-on, down-and-dirty approach to the subject material. You must do in order to understand the why.